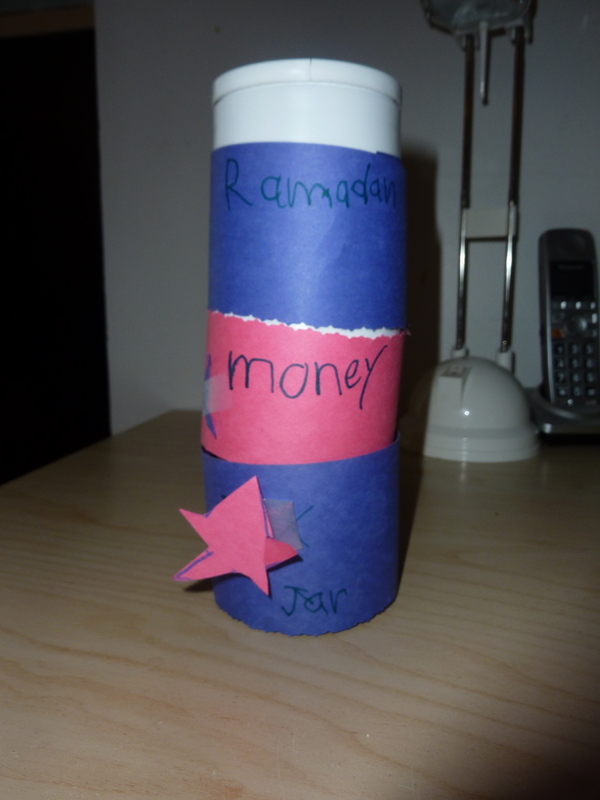 DS1 made his own “Sadaqah Jar” for Ramadan. Alhamdulillah he has the intention of giving saqadah in this blessed month of Ramadan. I made up this game to make it a little bit more fun as well as educational. Each player takes turn to roll the die. Player takes pennies according to the number they get. If you rolled 4, then you get four pennies for example. As the game goes on, players can exchange pennies into nickel, into dime and so on. This promotes a sense of coin value. Before we started we set an amount to be reached, say $2. This is the “victory” point. The player that collects $2 first is the winner. Winners get to choose to keep the funds or give is away in sadaqah (no pressure). I thought of another version of this game to reinforce name of coins. Label the die or spinner with names of coins. The Canadian version; penny, nickle, dime, quarter, dollar, loonie. Just nice for the six sides of the die. Let’s get the sadaqah jar full, Insya-Allah.